My mom's cancer has spread and we are trying to pay for her to start a new treatment. Also people can dontate money to help fund the treatment. The cancer had already spread to several places over the past 7 years including her bones and both lungs but now it has spread to her brain. She needs to receive brain radiation and begin treatment at the Burzynski Clinic soon but doesn't have the funds to cover the initial up-front fees and deposits. Also, to raise funds, we are hosting a Benefit Garage Sale & Silent Auction at 1st Baptist Church of Conroe TX on Saturday, November 13th. We are collecting items for the garage sale all across southeast Texas. So please come and/or donate items for the garage sale and silent auction! My family especially asks for your prayers during this difficult journey and thanks you ahead of time for your support! I believe we need a new speaker of the Texas House of Representatives. One who is more Conservative and more Republican than our current speaker Joe Straus. Below are the facts that I have read that have proved to me that Joe Straus is not the man to lead our Conservative Republican state. If you are a County Chairman or a leader of an organization like a Tea Party or a Republican Women's group, and you agree with this letter, please ADD YOUR NAME TO THE LETTER. Myself and many other Republican Leader have added their names to the list and it would really help if you added your name to the list as well. Under Joe Straus as Speaker of the Texas House of Representatives , many popular conservative measures were killed in the last legislature, including Voter ID (which had a 90% support rate among Republicans) and a very popular pro-life bill (which had nearly 70% support). 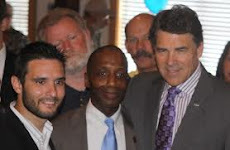 Both measures had already passed the Republican Senate and Governor Perry was waiting to sign them, but these (and many other conservative measures) were killed in the Hous e by the Republican Speaker and his liberal lieutenants. Speaker Joe Straus, as a state representative, voted to enrich (by "potentially tens of millions of dollars" - Texas Observer) his own family's gambling business interests (decade-old stock in the Austin Jockey Club, ownership in 3 horse &/or dog racetracks) by voting to increase gaming and gambling (HB 2265) and voting for casino gambling (HB 10) in Texas (specifically, slot machines allowed in racetracks.